World Health Organization (WHO) certifies India for eliminating yaws and maternal and neonatal tetanus. “India’s focused approach on making maternal and newborn care accessible to all and addressing health care equity more generally has made these remarkable successes possible,” Dr. Poonam Khetrapal Singh, WHO Regional Director for South-East Asia Region, said in a statement after presenting certificates to India’s Minister of Health and Family Welfare Minister. “These victories are not only India’s but all of humanity’s as the country accounts for approximately one-sixth of the world’s population,” she added. Transmitted by skin contact, the disease affects mostly children between the ages of five and 15, and appears as multiple lesions which eat away at faces, arms and hands, and deepen to the bones, disfiguring the child. Yaws is closely linked to poverty and is part of a family of disabling disease that affect the skin – along with leprosy – preventing children from attending school and placing an undue economic burden on local communities. In May, WHO certified India yaws-free after a team of experts verified interruption of disease transmission in the country. It is the first country under the 2012 WHO neglected tropical diseases roadmap to eliminate yaws, a disabling bacterial disease that results in severe disfigurement. 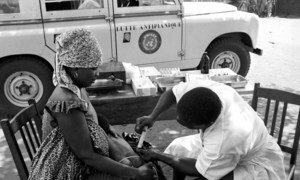 The agency described maternal and neonatal tetanus elimination (MNTE) as a “momentous public health feat,” as until a few decades ago the country reported 150,000 to 200,000 neonatal tetanus cases annually. Such tetanus cases are reduced to less than one case per 1,000 live births in all its 675 districts. According to WHO, both yaws and maternal and neonatal tetanus eliminations were achieved using the existing health system and health workforce. It noted sustained political commitment and clear policies, unified strategies, close supervision and monitoring, efforts of the frontline workers, and invaluable support of partners, particularly for MNTE, as key factors for the achievement. “Highly targeted awareness and early treatment campaigns in vulnerable communities enabled treatment of yaws cases and interruption of disease transmission,” Dr. Khetrapal Singh said. Both achievements will not only improve the health of marginalized communities, but will also enhance their socio-economic status and contribute to India’s wider development, the Regional Director added. WHO further noted that Indonesia was also validated for the elimination of maternal and neonatal tetanus in May this year. With this, the agency said, the entire South-East Asia Region has achieved elimination of maternal and neonatal tetanus, becoming the second region, after European Region, to achieve the feat. Indonesia and Timor-Leste are now the only remaining countries with yaws transmission in the South-East Asia Region. When Dr. Oriol Mitjà, a Spanish technical adviser for the United Nations World Health Organization (WHO), arrived in Lihir Island, Papua New Guinea, he expected to stay only a month. But after meeting hundreds of children covered in debilitating lesions, he stayed on, found a cure for their ailment, and spurred an international campaign that, if successful, will lead to the eradication of only the second disease in history.